Here’s the meal plan for 10/16/2011 to 10/22/2011. I’m pretty excited about this week’s plan! So, for breakfasts we keep it pretty simple. We eat oatmeal, cereal, fruit, or eggs and bacon. I’m also really tempted to try this baked pumpkin oatmeal recipe! Lunches are usually leftovers from the night before or sandwiches like egg salad and peanut butter and jelly. I made homemade lasagna for the first time ever today! It turned out really yummy, too! Here’s the recipe! Brown ground beef and Italian sausage in a frying pan with the onions and garlic. Drain excess fat. Stir in diced tomatoes, pasta sauce, dried basil , and Italian seasoning. You can let this simmer as long as you like. Preheat oven to 375 degrees. In a 13 x 9 baking dish, spread a little meat sauce. 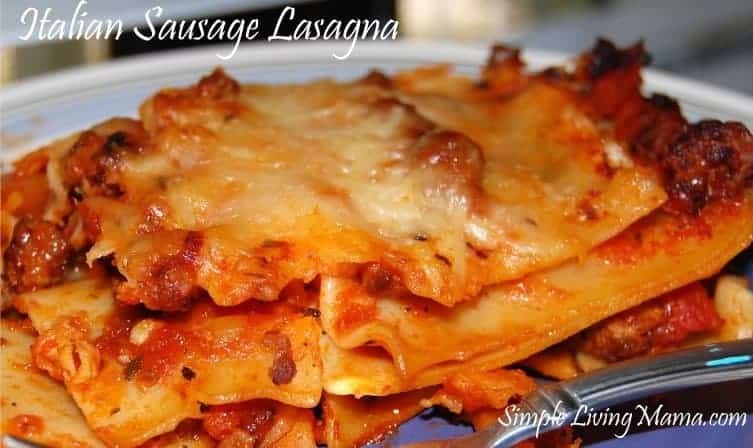 Lay three lasagna noodles over the sauce. Add more meat sauce and then sprinkle mozzarella and parmesan cheese over the top. Continue layering the noodles, sauce and cheese until you only have cheese on the top. Bake covered with foil for 25 minutes. Remove foil and bake for another 20 minutes to let the cheese brown. Enjoy! Obviously you can swap out ingredients to make this healthier. You can use your own pasta sauce, you can use whole-wheat noodles. A lot of people put ricotta or cottage cheese in the lasagna, but we don’t like it. This is a very versatile recipe! This post is linked to Plan It- Don’t Panic!